PORTLAND,�Ore.�(CNNMoney.com) -- You've heard of cat-sitters, dog-sitters and, of course, babysitters. But chicken-sitters? In Portland, Ore., a city known for its deep do-it-yourself streak and poultry-permissive laws, two backyard farmers have stepped up to meet an unusual need: watching hens when their owners go on vacation. In May, Rhonda Piasecki, 43, and Sharon Rowland, 35, launched Just Us Hens, which they believe is the nation's first chicken-sitting service. The business partners, who each boast a full roost of laying hens (four for Piasenki; eight for Rowland), met last year working at Portland's Urban Farm Store. "At the store, you'd just talk people's ears off about chickens," says Piasecki, who is also a drummer for Klickitat, a local jazz-rock band. But the seed the store sells started to aggravate Piasecki's asthma, right around the same time that Rowland decided she wanted to spend more time with her 3-year-old, chicken-loving son Sterling. A friend suggested that Piasecki become a "chicken consultant," while Rowland's husband floated the idea of seeking out hen-sitting gigs. So the women teamed up to offer a slate of services: $15 per visit for hen sitting, $25 for hen health house calls and $50 an hour for consultations on urban agriculture. In late May, they launched a blog, followed by a full website in early July. They also publicized their services at Portland's online chicken chat group, PDXBackyardChix, which has more than 1,000 members. The fledgling company has only a handful of customers. But as word passes through Portland's substantial population of urban hen keepers, they hope Just Us Hens will take off. There's certainly an audience for it. Chickens are all the rage in Portland, where longstanding city regulations allow residents to keep up to three of them -- but no roosters -- without a permit. Even Mayor Sam Adams has a brood: three hens, all named Alma. (Adams let his chief of staff's daughter, Alma, pick the names.) Hundreds of chicken enthusiasts will turn out on Saturday for Portland's seventh annual Tour de Coops, a self-guided stroll through 25 backyard hen houses, including the mayor's own. One of Just Us Hens' first customers was Renee Wrede, a nurse in Southwest Portland who worried about what would become of her new flock when she and her family took a beach vacation. Rowland signed on to watch "the girls": two barred Plymouth Rock hens, one Ameraucana, one Blue Laced Red Wyandotte and one Welsumer. During daily visits, Rowland fussed over Poppy, Hyacinth and the other chickens, holding and petting each one. After she fed and watered them, she emailed Wrede to report on how the birds were faring in her absence. Wrede was thrilled and says the service exceeded her expectations. "We do have a house-sitter, but she has no idea about chickens," Wrede explains. Rowland, on the other hand, was hard-working expert: "She even scooped the poop!" 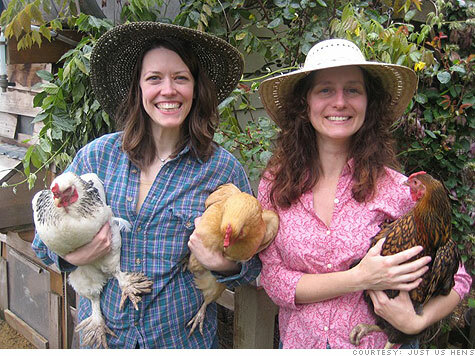 The proprietors of Just Us Hens pride themselves on creative problem-solving. "We welcome weird situations," Rowland says. Piasecki has developed a homegrown solution for a common poultry problem: hens plucking their own feathers. She located a chicken-loving seamstress in Arkansas, who she claims is the nation's best source for chicken aprons. The aprons run $7.50 apiece and can be draped over the chickens' problem areas. "They fit perfectly!" she says. Just Us Hens isn't the only chicken-related business to take flight in recent years. Katy Skinner, of Yacolt, Wash., runs The City Chicken, an online clearinghouse of chicken-keeping wisdom. She's seen entrepreneurs make money selling prefabricated coops or coop blueprints, as well as giving classes and lectures. But hen-sitting? Even for a seasoned chicken guru, that's something new. "This is the first I've heard of a hen-sitting service," she says. "I hope they get a lot of business!"